All bottles were opened and checked at around midday and I tasted between two and three pm. There was no decanting. All the wines had been delivered direct from the Estate in the week leading up to the tasting. The tasters were given the choice of which order to taste in, I went old to young as that follows the “order of Sylvain” which after all was the overriding theme of the day. With each vintage I have included the Domaine’s own notes of the vintage conditions in italics and then my note and score. Winter was mild without any severe frosts or heavy rains. January was totally dry. Little snow in February. March was also dry, and so was April! The vegetative cycle was recorded as totally problem-free. Hot summer with cool showers and start of grey rot stopped by the North wind beginning of September. The grapes were marked by the dry spells and rigorous sorting was required during the harvest. Degraded sweetness but precise enough, a dash of tangerine, nice wine with just enough fruit to flesh out the feeling that this is a little skinny. In my own biased way i’d love to have seen what 1996 could have been had it been 20 years later in terms of the site and winemaking (applies to too many 1996s). For all this faint praise it is every bit 17 (all scored out of 20) and for drinking now and over the next 5+ years. Cold winter with rains to replenish the water table. Spring was quite hot, dry with a very healthy North wind. Flowering occurred with good conditions. July was thundery and August hot with thunder rains when needed. The weather for the harvest was very sunny and there was no need to hurry as it was still possible to gain sugar without losing acidity. Slightly darker fruit than the 1996, lovely, easy, expressive fruit with a shade darker character. Tiny hint of green and a little spice. This faded later in the day a little with air but as a “pop, pour and drink” this is superb. If you own it, enjoy. I would! 17.5 Drink now. Winter was mild and not very wet with some frosts. May was warm. At the end of July-beginning of August grapes had to be green-harvested without losing any time. The harvest started on 20th September and the crop was very plentiful. I love 1999 as a vintage – far more than the other good nearer vintage of 2002 – this is both good and a little atypical for me in not being ready. Deeper, darker, more serious, more richness, good acidity and tannin. 17.5-18. Be patient, look again in 2-5 years. A particularly mild winter favoured a rapid start of the vegetative cycle from the first days of March. Berry set took place in excellent conditions with very little shatter or millerandage. July was marked by several disruptions but August was sunny and warm with a low rainfall. As a result, the 2000 vintage was one of the earliest harvests of the century. I’ve not tended to have the easy joy from 2000 red Burgundies of which others speak (more a 2001 chap me), but this is different. Deep but fresh, lovely, “1997 with knobs on”, deliciously good, lovely wine, open and easy but correct enough not to be too easy. Could drink a lot of this. 18-18.5. Drink now…what more are you waiting for? January, February and March were mild, with rather frequent rains. Lower temperatures in April. May was cool and relatively dry. After a wet period at the end of August, véraison was not yet finished. However, the skins were thick, promising complexity and quality as well as good resistance to grey rot. September was a happy surprise and harvesting started at the end of September. A dash of highness, very good depth, palate is taut and a little tighter than the 2000. Well defined and long. Impressive definition, serious. 18-18.5 but for classical reasons compared to 2000. Try again in 18 months or so. After a dry winter, spring was changeable but fine and warm during the flower period. During summer, dry spells alternated with cold spells and very hot weather. For over four months there was an extended dry spell in Burgundy. The heavy rains at the end of August and the beginning of September did not cause grey rot. Harvest took place in mid-September. Deep, more masculine, quite serious, deep (can’t get away from that works here) and fine with a little red fruit pepping through and some black fruits and spice on top. For the future but very promising. 18.5 +, give it 3-5 years. Longest note I wrote. Bold, inky, a nod to the Northern Rhone with the sweetness of the Southern Rhone. Spiced and decadently delicious. Bold intense, glycerol texture with hedonism written all over it. Sweet expressive and luscious in the extreme. You’d need to be in the mood but what a wine. If I had some I’d have a bottle every 18 months, could well be fabulous in old age. score is pointless really but 18-18.5 (if I have to) but you could score it 15 in one mood and 19.95 in another. When to drink it? When you feel like it! Until July, vintage 2004 was a promising one. Flowering has been a bit disturbed with alternance of sunny and hot periods then chilly ones. August was very gloomy; fortunately the sun came back in September with temperatures higher that 28°C some days. This estival weather combined to hot and dry windy periods allowed to maintain the vines in a good sanitary state. That was how the vintage has been saved. Well after 2003 and before 2005 is never going to be a good spot to “lurk”. This is not a bad 2004. It is a little stalky and slightly thin but correctly proportioned and not over worked (a massive potential error in 2004). It is a little spiky and acidic. 15, Drink. All conditions conspire to make 2005 an exceptional vintage. Flowering went well with enough millerandage caused by alternative warm and cold spells. Weather conditions were very favourable from the beginning of July until the end of September and even beyond that. Dry and sunny weather, cool nights; harvesting started early at mid-September. Sorting was easily done. Cold winter, rainy spring but a flowering in the best conditions : sunny and relatively hot. July was scorching, August rainy and cold but nice weather came back in September. 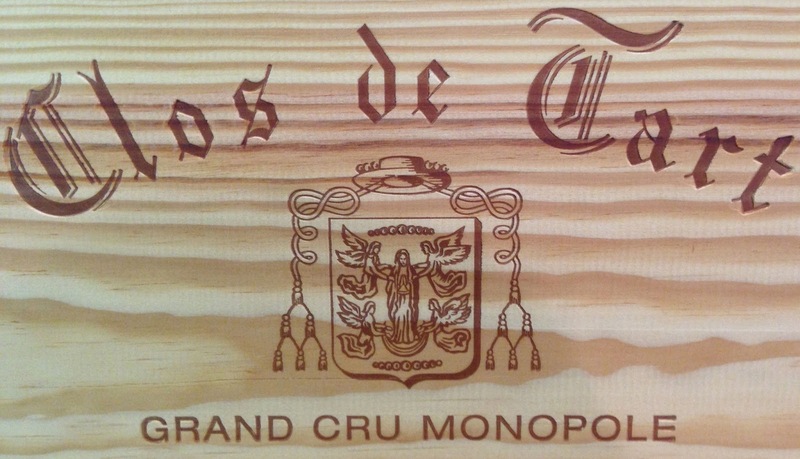 The Clos de Tart is a great ambassador of this vintage with captivating sensuality. In some other reports of this tasting you may not see the 2006 this is because the second bottle was corked (the only one in the tasting or dinner). Rich, full, mulled fruit, more beef, less refined but very good. I loved this but it is a bit of a Hermitage of a Burgundy, deep, very savoury, masculine. Vin de Garde. 18.25-18.75. Leave for 5 years and try again. 2007 Despite a gloomy summer season, the earliness of the growth cycle combined with a stringent annual work on the vines (de-budding, thinning and green harvest), the return of sunshine and dry weather from August 20th on, all these factors enabled us, after a drastic sorting out, to vat very ripe and healthy grapes. Slight whiff of tuna? Odd bottle may be? But actually that clears up, like a good 2004 with more flesh. I like this though it is may be a little under powered. Graceful. 17-17.5. Now onwards. Known as a ‘late’ vintage further to a cold and humid summer, the vine was delayed and we had to wait until September 13th to see the north wind settle down, bringing a bright and dry weather necessary to a full ripeness of the grapes. This stringent work in the vineyard had enabled us to crop perfectly healthy grapes needing very little sorting out in the winery. Moreover, the vine has naturally produced a lot of grapes ‘millerands’ considered as high quality factors for the wines. I think this could be the underestimated wine of the tasting. Almost green spice, pepper, delicious but clearly spiced. Lifted and with precise red fruit behind the spice. This is fine tuned, no unnecessary fat but with deliciousness, like a long distance runner. White pepper on the finish. One to follow closely I may be being conservative in score. 18-18.25+. Try again in 2-4 years, if flesh gets added this could be quite something. Ideal conditions during the whole growing cycle of the vine. In mid-September, the grapes were fully ripened with beautiful balance between sugar, acidity, tannins and aromas, the perfect sanitary conditions of the bunches being thus maintained until harvest time. With air this comes alive. It is a refined 2009 but has great sweetness. The weight it lovely, you keep expecting saturation and sun fruit but it never quite comes which is a part of its refined attraction. The tannins are there and are moreish. I anticipate this will gain flesh and it could well be really pretty special. Seems to have been made with a light hand…less is more. 18.25-19+. if you own it have a bottle now and then not for 5 years (my view). Freezing temperature in winter damaged the latent buds, a rather late flowering season with cool periods alternating with rainy or sunny spells, a predominantly damp summer which did not help the vegetation to catch up. “Vine-grower’s vintage” where hard work, foresight, anticipation, rigour, making the right decisions at the right time, in a word: experience, are the key factors to lead to an outstanding vintage. So airy and lifted, jumps out of the glass, so unlike the 2009. Very fragrant indeed, there is a strictness about it however once in the mouth, as with 2009 when the flesh comes this could be very special.As with a lot of the 2010…not a waste to try even now. Long term wine ultimately though. 19+ one bottle now but basically 5-10+ then try again. Weather conditions were whimsical and unpredictable. Sunlight was above average during spring and accelerated the whole process: bud burst, flowering and harvesting occurred surprisingly early, in spite of a relatively rainy summer. Nice dry and warm weather conditions only reappeared by the end of August which encouraged us to postpone the picking until grape maturity was complete. indicating a good phenolic maturity. The direct consequence: the smallest yield since 1969. A little reduced, taut, dense and tight. Intense deep and serious. Almost better than the 2010 for pure fruit but then it is silly to compare them. This will be fascinating to follow. Smart, actually smart plus. 18.5-19. Try in 2-5 years but I have feeling this is a keeper. The Clos de Tart grapes were survivors that escaped every possible hazard. They had to face cold, heavy drought, rain, oïdium pressure, late flowering, bunches turning into tendrils, aborted bunches, tiny berries, late colour changing and slow maturing, they only escaped hail and Botrytis pressure. The exceptional terroir quality and also the strenuous work of our vineyard workers, have permitted us to harvest grapes at optimal maturity after a long waiting. Fresh, fresh, fresh. Red fruit. So feminine and refined next to the Masculine back-rower that the 2012 may prove to be. More ballet than “dark arts”. Vivacious would be a good word. Hard to judge as it is only just in bottle. Lovely definition. 17.75- 18. I imagine this will be approachable early but it’d be a mistake not to take it seriously. Then having “allowed” both Sylvain and Jacques a brief rest we hosted a small “family and friends” dinner, in the offices. The way to start is almost always with Delamotte Blanc de Blancs NV from magnum, drinking as well as ever…just lifted freshness. With Clos de Tart not making any white wine what were we going to do? Well, here I had one of my rare good ideas…Nuits-St-Georges Blanc Clos de l’Arlot 1er Cru Monopole Domaine de l’Arlot 2011. The decision based on the fact that this was the first vintage that Jacques did at Domaine de l’Arlot before moving to Clos de Tart. The wine showed superbly on the night, opulent richness but never too much. The “Blanc” in Nuits-St-George 1er Cru only accounts for 6 hectares of the communes 150 hectare total. As this showed it tends to be generous wine…I’m tempted to squirrel away a few bottles. 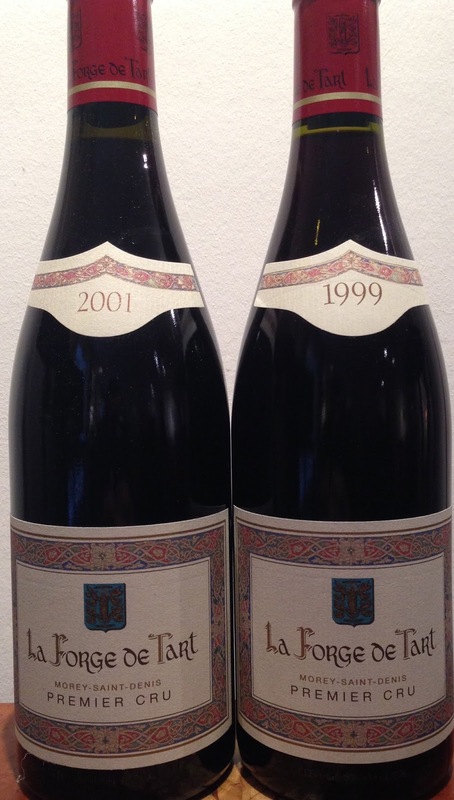 From now we were focussing on the Clos de Tart and that started with two vintages of La Forge de Tart – 2001 & 1999. Whether “Forge” is made or not is a decision based on blind tasting alone. 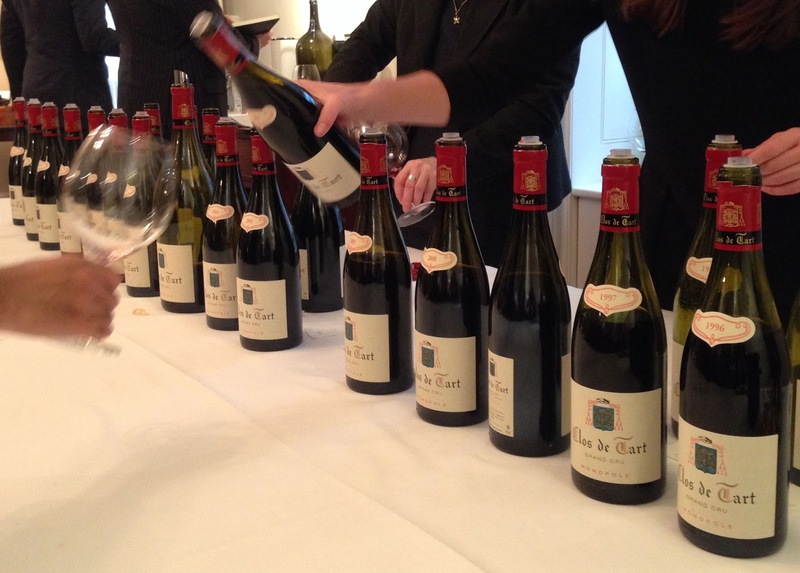 The basic premise is a simple one – the best sort of premise – that is a wine “is” Clos de Tart then that is where it goes. If it is not quite “Clos” but close than there will be a Forge. As a run of recent events and to give the idea there is no Forge in 2013, 2012, 2010, 2009 and there was one in 2011, 2008, 2006, 2001, 1999. I found the 2001 Forge to be generous and quite rich, restrained decadence if you like, really lovely to just drink and enjoy. 1999 was an all together more serious scenario, a shade reductive, still coiled tight, lovely and very promising but quite serious. So with the main course we had what you could call the main wines. 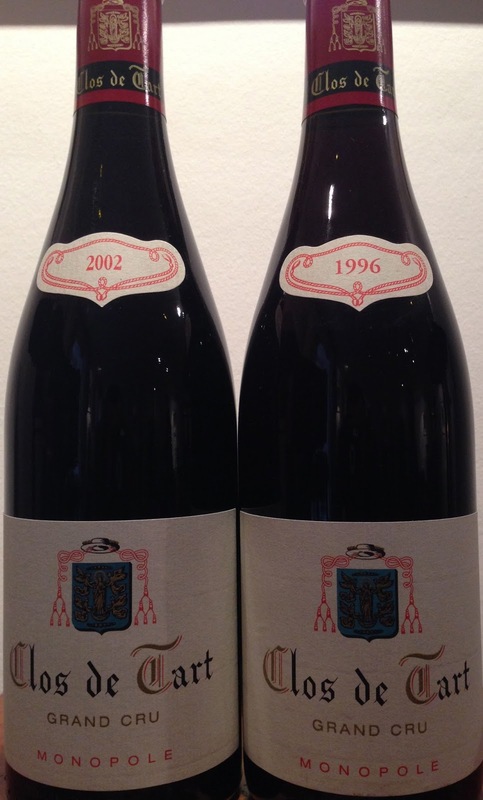 Clos de Tart 2002 and 1996 which was obviously an exciting proposition. The 2002 was what Sylvain described as a “Power wine”…big and rich but with lovely classical proportions, clearly one to follow, great potential to make wonderful “old bones”. The 1996 lives on its acidity a little more than the structure but I feel strongly that it is a 1996 that has “resolved” and mellowed, some haven’t, remaining excessively stern. Sylvain said of 1996, which was made months after he joined, that it was a vintage of “healthy grapes, slow maturity and requiring patience”. To bring a splendid evening to a finale we had a mystery magnum. The home team knew what it was but Sylvain, playful as ever, wanted it to be a competition so each table elected a spokesman and the guessing (sorry considered thoughts) began. I was slightly dreading my table getting it right as I am only just getting over the fact that “my” table was correct in assessing that a blind Romanee Conti was the 1965. My fears came home to roost when they revealed they felt it was 1988. So the wine? Well it was delicious which sounds hideously vague, there is a degraded decadence to it and I would not say it is more than in second gear, a mature but not old wine. Elements of soy and spice but an overriding impression of rich yet supple drinking. It was both bold and good of Sylvain and Jacques, who both spoke well through the evening, to choose a vintage that pre-dated the Pitiot Years.